One of these days I’m going to try this brand. I like the clean lines of the Sienna full cup, which is their bestseller and goes up to a British J. It comes out in blush this month and is already available in white, brulée and black. 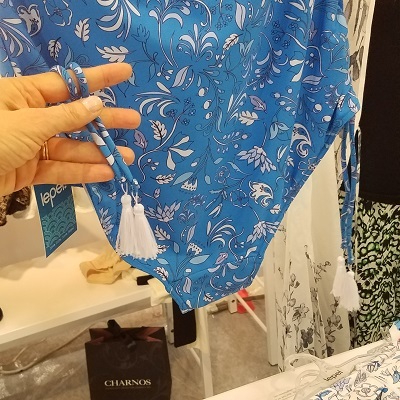 Charnos created a molded t-shirt bra for the US market. It goes up to a G cup and is coming in blush this season. Charnos has three more styles available to a J cup: Bridgette full-cup, Zara balconette, and Suzette full-cup, each retailing for $68. This is the Zara in ivory from a past season. It now comes in black. The full-cup Rosalind is pretty, especially in soft pink, but what’s even more exciting is that it’s coming in a body up to a G cup in soft pink, not just the white, brulée and black that you see on their website. The Flamenco comes out in blush this month and goes up to a G.
Finally, the Superfit padded strapless remains available to an H cup in 30-42 bands, and it sold so well in black that it’s now available in a bridal ivory. Isn’t the Lepel Fiesta in “denim” cute? Both the padded plunge and this full cup bra go up to a G cup. Available in March, the plunge retails for $60 and the full cup for $55. It will also be available in “primrose”. 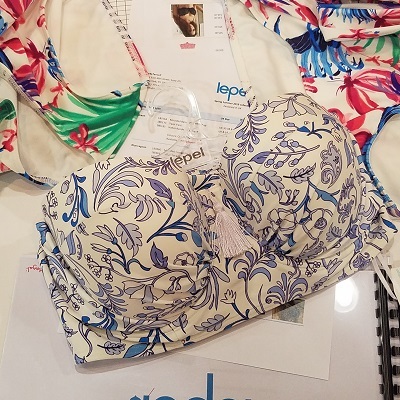 I was super excited to write about Lepel swim this year after discovering the Paradise longline long after it had sold out in most sizes. This year, the shape was supposed to return in “Sentorini”–with tassels! Sadly, I recently learned that the Lepel Swim SS19 collection was cancelled a few months ago because the company is being bought by new investors. I’ve been promised more information in a few weeks. In the meantime, these photos will show why I hope they move forward with this collection. It can be worn as a halter . . .
crossed in front . . . Here it is as a one-piece. Both styles go to British G cup.